Here’s a look at what’s coming out from DC for April 2015. A full list of solicitations are available here. This month kicks off the “Convergence” two-month-long event that’ll fill time (and coffers) while DC completes its move from New York to California. As such, there’s the core eight-issue-long event, plus a lot of tie-ins. While it’ll be definitely cheaper to buy all of these in trade paperback form (and I highly doubt I’ll be buying all of the above in single-issue form), a lot of these do look interesting, so I listed all of the interesting ones above. And yes, I know, it’s a very long list, but the tie-ins sound more interesting than the core issues (which sound, like everything about DC nowadays, overly Bat-centric). For starters, that’d be the pre-Crisis versions of Superboy and the Legion of Super-Heroes showing up; the art indicates the version published circa the early to mid 80s, per Invisible Kid in tow. Anyway, elsewhere (elsewhen? ), we’re also getting post-Crisis versions of Superman, Steel, Superboy, and Lois Lane. It’ll be the 90s versions of Steel and Superboy (the Kid’s cheesy 90s outfit and all). Meanwhile, it looks like the versions of Supes and Lois from when we last left them in 2011, when the New 52 came along. In this story, Lois is pregnant! (Superman’s also powerless, for some unstated reason.) 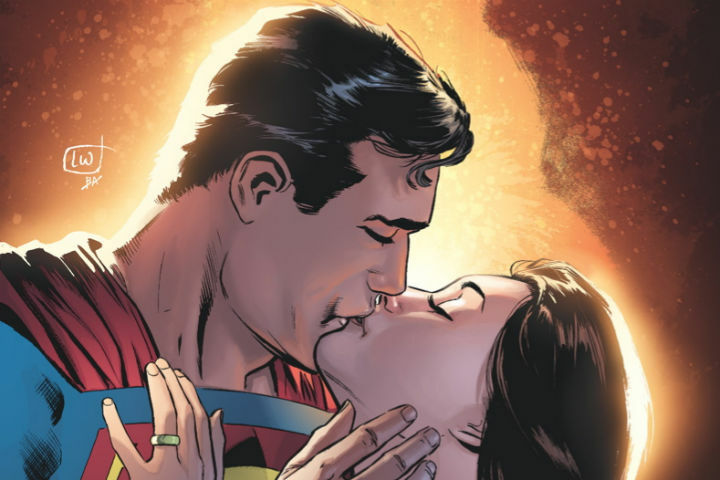 Hopefully, things will turn out all right for the couple, unlike what DC’s crassly done to a pregnant Lois in the video game-tied “Injustice” comics. “Speed Force” and “Harley Quinn” will feature what I assume are the 2000s version of Wally West (pre-Barry-return) and (guessing) a last-seen-in-2011 Harley. Of interest is both titles will feature Zoo Crew characters appearing. Capt. Carrot is confirmed for Harley (she’s somehow supposed to fight him), but the team member meeting Wally and company is unstated. Presumably, it’ll be Fastback, their speedster turtle member, though the most “unexpected” Zoo Crew-related character would be Fastback’s uncle, the Terrific Whatzit (DC’s first funny-animal superhero). Outside the DCU, “Wonder Woman ’77” is out in its sole one-shot issue, as the digital first issues are just for a short run. “Sensation,” however, is continuing as-is like the rest of the digital line, which are unaffected by DC’s move; the digital first side is already based from their California location. The title of "Man of Steel 2" is... "Batman v Superman: Dawn of Justice"? !